Producer IVN cooks up a dramatic trap inspired beat for lyrical beast SteveOG. Producer IVN cooks up a dramatic trap inspired beat for lyrical beast SteveOG; an MC who first came to my attention on the impressive 'Conscious', featured on 'Soundcloud Sessions' 19. On 'Fake', the drum claps are so tastefully designed and mixed that they never become overbearing even though they play such a sustained role; and the bassline is tuneful and fat enough to be enjoyed even on high street headphones which are usually not able to convey much in the way of low end info. SteveOG’s lyrical prowess will excite fans of Eminem, Tech N9ne and Joey Bada$$ with his message of endurance; his multi-syllabic delivery and his gruff, animated voice. The abrupt ending is the only potential bump in the road. I would have loved some epic strings or even a simple fade out of the beat; or perhaps a beat juggle and drop a la Timbaland's beat for The Game’s ‘Put you on The Game’, to provide some variety without changing the track up too much. Even with this potential quibble in mind, this track serves both as a great introduction to talented producer IVN; and is a welcome reintroduction to mega-talented MC SteveOG. 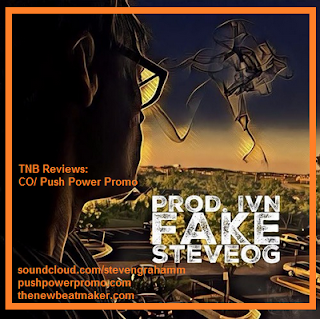 I have been paid to review SteveOG 'Fake' Produced by IVN, by Push Power Promo.